The town of Burke was founded at what was then called Bradley Prairie during construction of the Houston, East and West Texas Railway in 1881-82. At the time is was the northernmost point on the railroad and likely served as a temporary staging area for the construction. Burke is shown on this 1895 map of Angelina County. The arrival of the Houston East and West Texas Railroad in 1881 drastically changed the area. It refocused area settlement from Pine Valley and Ryan's Chapel to the east and led to the relocation of many early families. Prairies were also intense farming areas for the same reasons. That provided a reason for a town to develop to commercially serve the farmers. When Burke was founded in 1881, Lufkin and Diboll, the larger cities that now bracket Burke, did not yet exist. The largest town at time was Homer, the county seat. 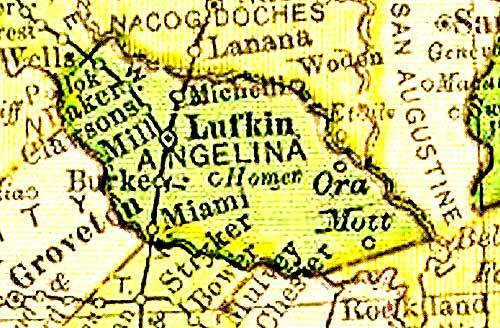 Lufkin was founded in 1982 shortly after Burke but did not begin to take off until 1890. Diboll was founded in 1894 by T. L. L. Temple as a sawmill town. From about 1881 until 1890 Burke was the main town in southwest Angelina County, and it retained its commercial viability until 1900 when Lufkin began to assume the role of leading town in the county. The main reason that Lufkin and Diboll flourished and Burke foundered is that Burke tied its future to farming while the other two towns relied on industry in the form of sawmills. Burke had two small sawmills, but their owners did not have the same commitment to growth as did the Kurths and Henderson in Lufkin and Temples in Diboll. The owner of the first sawmill, Stephen Treadwell, was also a farmer and cattleman. At the time the fertile farmland made farming seem like the better prospect. Neither Lufkin had the luxury of the fertile soil of Bradley Prairie, and they had to depend upon the sawmill industry, which proved to be the economic engine of the future. Legend says that one reason Lufkin prospered is that the railroad wanted to build a switchyard but that Burke farmland was so expensive that the yard was located in Lufkin instead. There may be some truth to that, but the railroad promoted Lufkin more than Burke. Burke appears to have grown up spontaneously without much help from the railroad beyond simply passing through Bradley Priairie. By contrast in Lufkin, railroad official Paul Bremond platted and sold lots in Lufkin. Several streets in Lufkin are named for HE&WT railroad officials including Bremond. Included in this namesake group streets was Burke Street, which was probably named for Houston merchant and probably railroad Andrew J. Burke. He was the father of Edmund Burke for whom the town of Burke was named. The man for whom Burke was reportedly named is undoubtedly Edmund L. Burke, who was shown in the 1880 census living in Houston with his father Andrew J. Burke, a cotton factor, and his mother Elvira and several siblings, including one who was a cotton buyer. Ed Burke was 27 years old and listed as an "R. R. Conductor". Ed was born in Texas, but his father and mother were from Tennessee and Alabama respectively. Ed probably was able to sign on to the HE&WT construction project through his railroad connections. He undoubtedly gained his surveying skills as a result of his family's business. Cotton buyers would probably purchase a cotton crop in the field before it was picked. To do so a cotton buyer had to be able to accurately measure a field using skills similar to those used by a land surveyor. Initially the new town was named Rhodes in honor of general store owner W. R. Rhodes and postmaster H. R. Rhodes, but in 1885 it was renamed for Ed Burke, a civil engineer who took part in the railroad survey. It is incorrectly assumed by many that Ed Burke was an ancestor of Lee Burke who ran a store in Burke in partnership with Miss Ina McCall in the early 20th Century. It is not known why the town was renamed, but many towns were renamed at the insistence of the Post Office to avoid confusion with other cities. From 1886 to 1955 Burke had a post office, but it was downgraded to a substation, which was closed probably in the 1960s.. These gentlemen carry a full supply of general merchandise, such as dry goods, groceries; hardware, crockery, hats, caps, clothing and notions. Being wide awake, well posted business men, they control trade amounting to from $6,000 to $9,000 annually. Carries a general stock of drugs patent medicines and fancy articles. Has an assortment of every thing usually found in a country store. This gentleman is a dentist and watchmaker, and ready to do any work in his line. In 1897 Burke had an estimated population of 650. The Burke Methodist Church was organized in 1899-1900, and the First Baptist Church of Burke in 1905. The Baptist church grew steadily until it's membership reached a high of 302 in 1965. By 1904 Burke's population had plummeted to 161, a loss that may be explained by the rise of Lufkin, eight miles north, as an industrial center for the county. However, by 1915 the population had risen to 200, and by 1925 it stood at 300. The earliest road for automobiles was the Old Houston Road, which was merely a dirt road. The history of that early road is unknown. The first paved road was Texas Highway 35, which parallels the railroad tracks and is now known as the Old Diboll Highway. It was probably built probably in the mid-1920's. In the late 1940s U. S. Highway 59 was built about a quarter mile east of the old highway. The highway was expanded to 4 lanes in the late 1960's. Present plans call for contstruction of a new Interstate 69 to follow the route of US 59 from Houston to Diboll and then bypass Diboll, Burke, and Lufkin to the east. In 1964 the Burke school was consolidated with the Diboll Independent School District. However, by 1966 enough new arrivals were building homes to warrant incorporation and the construction of a municipal water system. Burke had a population of 322 in 1980 and 314 in 1990. Burke still exists primarily as a residential community for people who work in Lufkin and Diboll. R. W. Haltom, "History and Description of Angelina County, Texas"
Handbook of Texas Online, "Houston East And West Texas Railway"
Historical Marker, Texas Historical Commission, "Burke School"